Tonight on CBS their new drama The Code premieres with an all-new Tuesday, April 15, 2019, season 1 episode 2 called “P.O.G,” and we have your weekly The Code recap below. 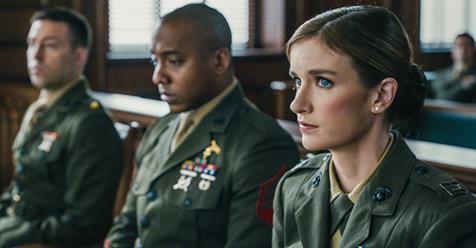 On tonight’s The Code premiere episode as per the CBS synopsis, “Captains John Abraham and Maya Dobbins head to a war zone when they are assigned to opposite sides of the courtroom in the case of Marine charged with abandoning his post during combat, resulting in the deaths of three soldiers. So make sure to bookmark this spot and come back between 9 PM – 10 PM ET for our The Code recap. While you wait for our recap make sure to check out all our Masterchef Junior videos, pics, news & recaps, right here! Tonight’s The Code recap begins now – Refresh Page often to get the most current updates! Several soldiers return to base with one bleeding badly. They report that something went wrong during a firefight and they were out in the open with no coverage. They determine that one of their own was hiding during combat. The case of cowardice is brought to Maya and Abe. Trey is going to stay back because his wife is ovulating. Maya and Abe head out with Lee. They arrive to meet the marine who is accused of abandoning his peers. He tells them otherwise, detailing the scene of the fight. Abe tells Maya they are going back to where the fight was even if it is a hostile area. They head to the base to talk to the soldier’s direct command who tells them he will take them to the area and building where the fight went down. Abe and Maya arrive at the site. Maya doesn’t see what the marine reported; bullet holes in the side of the building, a shrine on a rooftop. They look around and end up speaking with a local whose son saw the soldier in the basement of one of the buildings. He stayed in there during the fight with his head in his hands, crying. It looks like he did abandon his post. On their way home Lee, Abe, and Maya go back and forth on what to do. Abe and Maya try to settle on an appropriate deal. Any deal he does take will make him a dishonest discharge. Maya meets with the marine and tells him what they are up against. She doesn’t share but she thinks he is guilty. He insists he is innocent and tells her he isn’t taking a deal. Glenn and Trey try to work out a deal with Spain were some of their bases lye. After a hairy meeting the day before, the representatives for Spain fail to show. Trey isn’t sure what to do now. A hearing for the marine Jared who is accused of cowardice begins. Maya thinks the marine was misidentified. In the middle of the hearing, Jared becomes upset and begins breathing heavily as if he is panicking. They call a recess. Outside he collapses. He is brought to the hospital where he denies having a panic attack. Meanwhile, Abe and Lee discover Jared brought meds for a panic disorder from another man. Abe tells Maya she needs her client to admit guilt. If he doesn’t he will expose Jared as a liar on the stand. In court the next day Jared stands to make a statement. He admits he has always wanted to be a marine but there is something that is broken within him. He wants to change his plea to guilty. He cries as he tells the court. Maya comforts him after. Abe sends Lee on a mini vacation so she can work on her wedding plans. He tells her he teases her and gives her a hard time but she is truly not a boot, but a marine. Trey meets with a Spanish official who tells him he and his wife tried for a baby for a long time. They have twins now. Meanwhile, Glenn gets a visit from some officers most likely about her son who is a soldier.